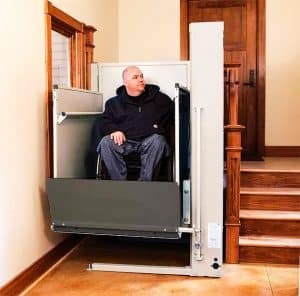 Vertical Platform Lifts (VPL), also known as porch lifts, allow wheelchair users and anyone else facing mobility issues to gain access to raised porches, decks and such through a seamless vertical transportation. For residential and commercial buildings, vertical platform lifts are a great alternative to ramps. Orthopedic Service Company handles the installment of vertical platform lifts in Durham, NC. Contact us today to find out more about the type of VPL best suited for your needs. Vertical platform lifts can be installed both indoors or outdoors.Thanks to them, the user only needs to roll onto the platform, and just like an elevator would do, at the push of a button the lift will rise to the deck or porch level in no more than 30 to 60 seconds. Contact Orthopedic Service Company for further information regarding vertical platform lifts in Durham, NC.